First of three. These were painted together – small panels that would fit between doors in a hallway. However, I’ve hung them together in the booth and some people have considered they would make a nice triptych. #1364 “Just us Three”. Refractured watercolor on panel 18×5″ $60 inc shipping! I always love getting this newsletter whenever Gavin gets to writing one. The vacations sound a little cold for this desert rat, but the necklaces and earrings on the ‘Buy Cloud Jewelry‘ page look like I might need to sent Santa some fake news about how good I’ve been this year…. How good? My cloud painting ‘The Road to Selfoss’ is on the front page of their website this month. That’s not fake news! It was painted from a photograph by my good friend Murray Foote. Yes, it’s true that you need clouds to add a lot of color to the morning. Here, I’ve also added cloud shapes to the theme. This is one of the reasons, when I’m running a watercolor collage workshop, I tell people that after I create a refractured watercolor, there’s almost*** always pieces left over. This is one of the structures where there isn’t. 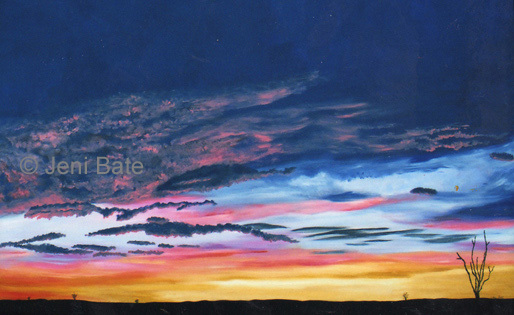 A 24×18″ watercolor only just* makes a 14×11″ refractured watercolor in cloud shapes.